The company, RoosterFin, was founded by Joe, a former school teacher. He is able to create games that are not only fun, but also apply math skills. Joe “RoosterFin” Balcuk started the business by learning the addictive qualities in games. He observed kids in the classroom, studied game theory, and played hours of video and board games. Then Joe took a pencil, some graph paper, and a shoestring budget and turned it into a line of family-friendly games. 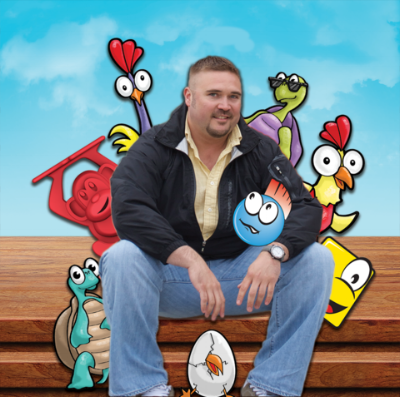 Joe’s background, coupled with his years teaching kids, enables him to create award-winning games that are simultaneously simple to learn and fun to play. Joe has left his life in the classroom behind, and is now devoting his full attention to making great games. The Bouncing Bots game comes with minimal parts and simple instructions. I like this because it means less of a chance for things to get lost. You are supplies with 8 little bouncing bots, two targets, and instructions. Each player gets two bots of the same color, so you can have up to 4 players. The instructions provide descriptions of the bots so you can choose your favorites based on personality, or characteristics, or color. Next you set up the two targets. You can either set them up as platforms, or as bowls. At this point let me note that the game is for players 6 and older, however my playmate is 4.5. We opted for the bowl type setup as we felt it was easier to get the bots in the target. The game play involves bouncing your bots on the floor and getting them to land in the target. You start with the youngest person and then take turns until everyone is out of bots. Once your bots are in you check if they landed touching a 2 point of 3 point spot. If they are touching two spots, you go with the higher valued spot. Then you add up your points. The goal is to be the first to get to 9 points. First off, I want to let you know that the game is kind of addicting. When I was just checking it out on my own, sans small playmates, I had fun just trying to get better and better at aiming my bot. That said, it does take practice to actually get your bounce right. I would definitely start with the bowl setup and then eventually graduate to the platform setup. Once I started playing with T, it quickly became clear why the game is for 6 and up. Tyler was not yet coordinated enough to understand and successfully achieve bouncing the bot on the floor and getting him to land on the target. Since he doesn't necessarily have the best aim in general, we bent the rules a bit and just let him toss it into the target. Once we did that, he had a blast. He even helped me add up the scores. This is definitely a fun game for family time. T even liked just playing with the bots and learning their bios. He started introducing them to his one year old sister which was definitely fun to watch. I would totally recommend this game for slightly older kids. Its a great combination of math and motor skills. You can check it out here Bouncing Bots. You can also check out this and other games directly from the RoosterFin website.